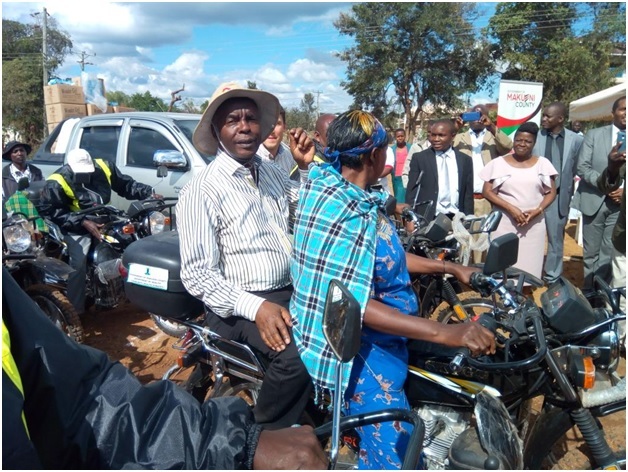 Community Health Volunteers in Makueni county have received 45 motorbikes from the county government which will help them in their Communal Work. Makueni County Governor Prof. Kivutha Kibwana has said that this initiative should be supported in order to enhance medication in Makueni County. Speaking in Wote, Makueni county where this initiative took place, Makueni County Health CEC Dr. Andrew Mutava Mulwa praised the health workers saying that they help expectant mothers right from antenatal visits to their delivery. Dr Mulwa added that these workers have helped in ensuring that high levels of hygiene are observed in the county which he said has reduced cases of diseases caused poor hygiene. Also in attendance was the Ministry of Health Chief Officer Dr. Patrick Musyoki, who said that the ministry will ensure that this initiative grows and in no time people from other counties will visit Makueni to benchmark with these Community Health Volunteers. “We are setting up good plans within the Ministry and in the very near future am sure people will come to benchmark with these Community Health Volunteers. ”He said. “Before the issuance of the motorbikes by the County Government of Makueni, it has been difficult for us to reach the sick and taking them to hospital especially the expectant mothers but now we are happy that our work has been made easier” a community Health Volunteer stated.